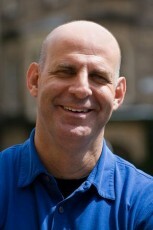 Harlan Coben is the best-selling author of 28 fast-paced novels of suspense. His latest book, Fool Me Once, features a protagonist suffering from PTSD. Eight of his novels feature an amateur detective in the sports field named Myron Bolitor. He also has a young adult series featuring that character’s nephew, and a children’s book titled The Magical Fantastical Fridge. His novel Tell No One became an acclaimed French film. After the interview was conducted, Julia Roberts was announced as the producer and star of a film version of Fool Me Once. This interview was recorded at Book Passage Bookstore in Corte Madera, California, and a shorter version can be heard on the Bookwaves radio program.